What a wonderful time of year we’re coming into, with the prospect of warmer weather, longer days, boiled crawfish and spring planting just ahead of us. If you haven’t already made your garden plans, now is the time to do so, even if your garden is limited to a few pots on the patio or balcony. It’s remarkable how much can be grown in small spaces with minimal effort. The payoff, whether you have a large plot or minimalist plantings, is being able to walk outside and harvest part of your dinner. Freshness is the key, and spring plantings of tomatoes, basil and bell peppers will reap many rewards in the coming months. Open a seed catalogue and be astounded by the many varieties of tomatoes available to the home gardener – large tomatoes, small ones, cherry tomatoes, currant tomatoes, red, pink, orange, yellow, white, green tomatoes. Local stores may not offer such a wide range of plants, but there are still enough selections to please the gardener who wants to experiment with new varieties. Some are particularly suited for container gardening. There is nothing that can match the pleasure of eating a tomato you’ve just picked from a plant you’ve grown. fertilize: Before planting, at first fruit set, and every 2-3 weeks thereafter. 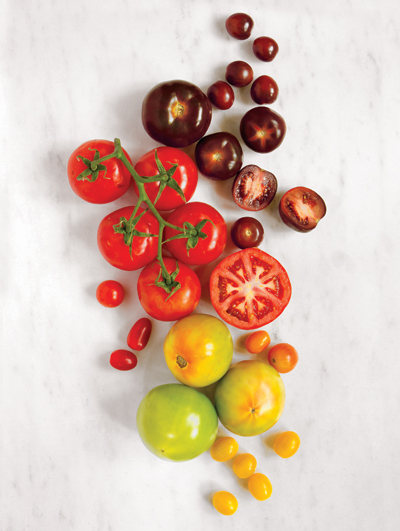 tip: Plant several varieties of tomatoes, both to hedge against crop loss and for diversity on the table. Tomatoes provide vitamins C and K, potassium, molybdenum, fiber, glutamic acid and phytonutrients. This sandwich, which I eat almost daily during our tomato season, is, in my mind, the very epitome of summer. The combination of ingredients is classic with nothing added that would detract from their simple and essential goodness. Split a poor boy loaf or a length of French bread and drizzle the interior generously with extra-virgin olive oil. Fill the loaf with slices of fresh mozzarella, sliced tomatoes and fresh basil leaves. Season with coarse salt and freshly ground black pepper. There may be worse things you can do to a tomato than putting it in the refrigerator, but not by much. Refrigeration destroys a tomato's delicate flavor, so don't do it! One of the “holy trinity” in Cajun cooking, bell peppers are essential in many dishes, as well as a favorite salad ingredient. There was a time when we saw only green bell peppers, but today there are red, yellow, orange, lilac, purple and chocolate-colored peppers which can add a rainbow of color to your table. tip: Pepper are good container plants. Bell peppers are a source of vitamins C and E, pyridoxine, folate, fiber, potassium and phytonutrients. Treat your family or guests to a beautiful antipasto selection of multi-colored roasted peppers, tomato wedges with basil, anchovies, sliced hard-boiled eggs, olives, cured meats, and cheeses, along with plenty of crusty bread and wine. Roast 4 peppers of different colors over a gas flame, under a broiler or on a grill, turning them with a pair of tongs as they char. When the peppers are blackened all over, put them in a glass or metal bowl and cover. Leave them to steam until cool enough to handle. Pull off the charred skin of each pepper, then split lengthwise. Remove stem, ribs and seeds. Slice peppers lengthwise into strips about ¼-inch wide. Arrange the pepper strips on as platter, drizzle with olive oil and season with coarse salt. In any preparation, using peppers of various colors will enhance the presentation. Life without basil might not exactly be unthinkable, but it sure would be less pleasurable. Basil is a tomato’s best friend, both in the garden and on the table. Available in a variety of leaf shapes, colors, and flavor characteristics, basil thrives in containers as well as in the ground. It can be grown in almost anything – window boxes, pots, olive oil or coffee cans. Basil won’t tolerate frost, but small containers can be brought inside when cold weather threatens, thus assuring a year-round supply. tip: Basil and tomatoes are companion plants; growing them together is thought to improve both. This versatile Italian classic is good on almost anything—pasta, seafood, grilled vegetables, poultry, or meats. Pecans or walnuts can be substituted for pine nuts. In the bowl of a food processor fitted with a metal blade, combine 2 cups loosely packed fresh basil leaves, 1 clove peeled garlic, ¼ cup pine nuts, and ¼ cup freshly grated Parmesan. Pulse a few times to combine, then, with the motor running, drizzle in ¼ cup (or more) of extra-virgin olive oil until you have a creamy emulsion. Season to taste with coarse salt. Puree fresh basil with olive oil in a blender, then freeze in small portions for use during the winter.